To say that cancer is a complex disease to understand and a difficult disease to treat would be a great understatement. Those that have lost loved ones to cancer describe the experience as a long and torturous path, full of deception. At times those diagnosed with cancer seem as though they have their energy back, eating food and sharing moments with close family members in a growing air of optimism, which is then subdued by unpredictable crashes of ill-health. What is certain however is that the experience is not the same for everyone. My own mother-in-law passed away from cancer sadly before my wife and I got married. Seeing my wife grieve was difficult because I felt very helpless. I was studying at the time and in fact, I contribute the direction that my life is heading now to that moment in time. I work in the exciting field of cancer research. I’m fairly low in the academic hierarchy (as a first-year PhD student), but what I lack in experience, I make up in enthusiasm and of course, one of the most frequent questions that is asked of me by my friends and family is whether or not we are closer to finding a “cure”. I usually try to provide some sort of answer, but if I am honest with myself it is rarely clear enough for everyone to understand. So this time lets start from the very beginning. With cancer the relationship status is “complicated”. Our body is made up of trillions of cells. Each cell has a particular identity and purpose both of which are programmed by genes coded by DNA. These genes are turned “on” and “off” at different rates and for changeable durations during the lifetime of that cell. You may without realising tried to imagine this like a light switch; instead a better way to consider it is like a dimmer switch. The output in this case is the great macromolecules called proteins. So DNA is the language that describes the genes, whilst the genes encode for proteins, this is often referred to as the central dogma of molecular biology. The proteins are the hard-working molecules in the cells that have a specific function. Some of them provide structural support, others are involved in elegant processes such as DNA replication whilst some proteins have crucial enzymatic activity to allow them to control cellular metabolism and to pass information from outside of the cell to the inside of the cell. As you can imagine, the inside of a cell is a busy place and in amongst this chaos there is a delicate balance keeping that cell alive. To really understand what cancer is, you have to come to terms with a shocking fact. Your cells are constantly thinking of suicide. It’s called programmed cell death or if you prefer the buzzword, its called apoptosis. For cells to continue to grow and divide they need to respond to growth signals which allow them to progress through the cell cycle. The cell cycle is composed of periods of growth, replication (mitosis) and resting. Crucially, cells are not supposed to go through this cell cycle without regulation. So there are molecules that create checkpoints, that ensure that cells are progressing through this cycle correctly. Occasionally this cycle becomes entirely unregulated, allowing the cells to grow uncontrollably. If this happens, apoptosis kicks in and the cell decides to kill itself rather than going on an endless cycle of proliferation. It is a noble act, cells killing themselves to ensure the survival of the whole organism, and yet cancerous cells are far from noble. Some cancer cells are able to turn off the process of apoptosis entirely, but it doesn’t stop there. They are also able to evade cell cycle checkpoints giving them a clear path to continue replicating, growing and dividing. What started off as a humble, single cell soon turns into a tumour (a group of cancerous cells). This is what cancer is. It is a disease that starts from one cell before becoming many damaging cells. Scientists have been working hard to understand the origins of cancer. At the most basic level, cancers arise as a result of one cell gaining a genetic mutation. This is where the DNA in the nucleus of the cell becomes damaged, particularly the parts of the DNA that encode for a gene. If it affects the genes then you might be thinking that cancers are always inherited, this is actually not true and in fact only 5-10% of cancers show strong dominant mode of inheritance, whilst 10-15% show a relatively weak correlation and may require additional environmental factors leading to the onset of cancer. Sadly, the vast majority of cancers are sporadic. This makes it incredibly difficult to determine who will and who won’t get cancer. Having said that, scientists have attempted to characterise both the genetic and the non-genetic risk factors for some of the cancers. A genetic risk factor, is where a mutation (DNA damage) in a specific gene results in an elevated incidence of cancer. For breast cancers, a genetic risk factor includes mutations in the BRCA1 and BRCA2 genes. These genes are called tumour suppressors, because when these genes are turned “on”, the resulting protein stop uncontrolled cell growth – hence the term suppressor. When the gene is mutated the protein that the gene codes for doesn’t work properly and the important function it could once do is lost. A non-genetic risk factor is relatively easier to understand, such as smoking. Smoking is so clearly correlated to lung cancers, there has been significant effort made to ensure smokers are aware of the said risks. Characterisation of these genetic and non-genetic risk factors take considerable time, but that hasn’t stopped some scientists. The Sanger Institute in Cambridge is currently embarking on the Cancer Genome Project which is trying to identify the genes that are mutated in cancers, particularly the ones that arise as a result of sporadic mutations. It is believed that this study will be able to identify a list of genes that play a significant role in cancer progression and allow for the development of focused therapies. Identification of the non-genetic risk factors is in contrast less focused, with numourous research groups working on the issue by attempting to understand the environmental background of people that get cancer. Some of these examples include levels of exercise, diet, viral and bacterial infections, alcohol abuse and so on. These are believed to be factors that you can control and unlike your genetic make-up, which cannot change after birth, health professionals can instead help you make behavioural decisions to prevent the onset of cancer. One more reason to eat your 5-a-day! What about therapies, what is the biggest challenge? Trying to remove cancerous cells from your body is like trying to do something very precise with an extremely blunt and large object. The most profound issue is specificity. When people think of cancer treatments, more often than not, they think of chemotherapy; a mixture of drugs taken to kill the cancer cells. However, ensuring that the drugs only target the cancerous cells is substantial challenege. One of the physical characteristics of cancer cells is their ability to divide rapidly and continue growing at a faster rate than healthy cells. As a result many drugs attempt to inhibit the DNA replication machinery in these cells, as cells need to replicate their DNA to continue dividing. These therapies are non-specific and healthy cells that also grow fairly rapidly are affected by the treatment. One such example are the white blood cells that are fundamental in mounting an immune response against bacteria and viruses. So whilst the chemotherapy may have an opportunity to kill the cancerous cells, the cancer patient is likely to become immunocompromised after sustained chemotherapy, it can lead to the increased risk of patient suffering from opportunistic infections. All is not lost though. Novel treatments include targeted therapies by using antibodies to deliver a payload of cytotoxic (cell killing) drugs. Antibodies are molecules that are able to specifically bind to bacteria and viruses allowing your white blood cells to find them and destroy them. Rituximab is an example of a chimeric antibody which is able to bind to cancerous white blood cells and initiating apoptosis. Such targeted therapies are an important focal point for cancer research and continues to be a promising avenue of research. Cancer researchers are one of the most determined bunch of scientists I have ever met. They often work deep into their week nights and over their weekends. Although scientists have yet to find a “cure” for cancer, there is hope knowing that we are steadily winning the battle against cancer. The below chart shows how over the last 30-years the survival rates for breast cancer have increased, which is a great achievement against one of toughest medical challenges faced by modern day humans. What is certain though, as per the billboard by the Leukaemia Research Fund, is that scientists won’t hang up their coats until the job is done. Breast Cancer Survival Rates, Cancer Research UK. Also, its really interesting to know that something inside us is constantly thinking of killing itself lol! This is amazing! Keep it up! This is an engaging, informative and succint piece of writing- you take a very difficult topic and make it very easy to understand! I look forward to reading your other entries. I don’t know much about cancer but I found this to be a great read for a person with only a cursory understanding of this field of science. I find the idea that all cells are programmed to die quite profound especially regarding its philosophical implications on the nature of our lives on this planet. From my understanding of this article and cancer research, surely a step forward would be to improve the cell specificity of cancer drugs whilst attempting to balance its unavoidable effects on the surrounding cells which leads to unwanted side effects such as causing immunodeficiency issues. Also regarding genetic factors which lead to cancers – surely these cannot just be sporadic genetic cards of fate handed out to the unlucky, there has to be some sort of pattern here or correlation which scientists need to establish? Finally – is there any sort of medication or scientific research which has gone into attempting to reestablish the structure of these malformed protein which are needed in order to act as the ‘switches’ which stop cell replication, perhaps via stem cell research, or through medication/ operations/ treatment during a persons early developmental stage? great writing, very powerful and lucid. Thanks for taking time to read the post. Your questions are sound and certainly important. It is without a shadow of doubt one of the most important challenges, to ensure that the drugs are not only targeted to the cancer cells but also that their toxicity is controlled in such a way that the tumour is affected minimising and any collateral effects. Immunodeficiency is not the only issue that can been damaging. If you chart duration of chemotherapy exposure against toxicity, somewhere along the graph you encounter organ failure too. So if the tumour has not responded to the treatment, you actually have to withdraw the treatment entirely as it can lead to severe irreparable damage to the organs. We do have other more targeted therapies included radiotherapy. This is where we exposure the tumour to a source of radiation that is focused on the cancerous area. This then kills the cells by mutating the DNA to such an extent that the cell cannot continue to grow. With regards to the genetic factors. The point that I was trying to make is that most cancers are sporadic, but of course not all. This isn’t necessarily bad news; it tells us that the non-genetic risk factors in sporadic cases are of even greater importance, as these people didn’t necessary have a genetic disposition and rather we need to do considerable research in understanding how their relationship with the environment let the cancer arise. Take sun beds for example. If you were to use a sun bed every day for extended durations of exposure, the amount of UV radiation that your skin will get exposed to would be much higher than the natural amount of UV radiation that you would get exposed to on a sunny day, hence you chance of getting skin cancer is increased, even though you may not have had an inherited genetic mutation from your parents. In such a case the non-genetic risk factor – “sun bed” had a huge impact. Correlating your environmental experiences to health outcomes is an exceptional challenge because it means you’re trying to choose a number of parameters to measure and then measure the impact of such parameters against a health outcome. You will be happy to know, that such research is intact being carried out and is usually the work of epidemiologists and biostatisticians. Finally, the philosophical aspect. It is really interesting how cells are poised to die and it is the presence of molecule survival signals that keep them going. What is even more interesting in my opinion, is how cancer is a case when cells are immortal. In the laboratory, I usually grow cells in flasks and they are immortalised and in a strange twist of irony, it is once something become immortal inside you, that it begins to consume you and kill you. Cancer cells are immortal, as they do not require survival signals to continue, they have over-ridden programmed cell death, they essentially don’t care about the multicellular organism anymore. So yeah. It’s all philosophically very very interesting. Thanks again for stopping by! Please subscribe and thanks for supporting this very small effort. Thank you for your detailed response. I will look into this subject further. Woah! I actually understood the article. Thank you for breaking and dumbing it down. The suicide cells bit made me giggle. We all have some emoness inside us. This was an informative and interesting read. It helped to understand cancer a lot more in terms of cells! Having also lost a family member from the belligerent battle of cancer i have also experienced the the emotional impact it has on a person, and reading this article has instilled a sense of hope in my heart. As a muslim i believe in the Quran Allah (SWT) says how every disease has a cure, and i’m thrilled to see that the incurable disease known as cancer, is constantly being battled for a cure, and we are not losing the battle. First, cancer is not one disease, it makes a huge difference which type of cancer you have. To me, it doesn’t make much sense to talk about cancer without specifying what flavour it is. 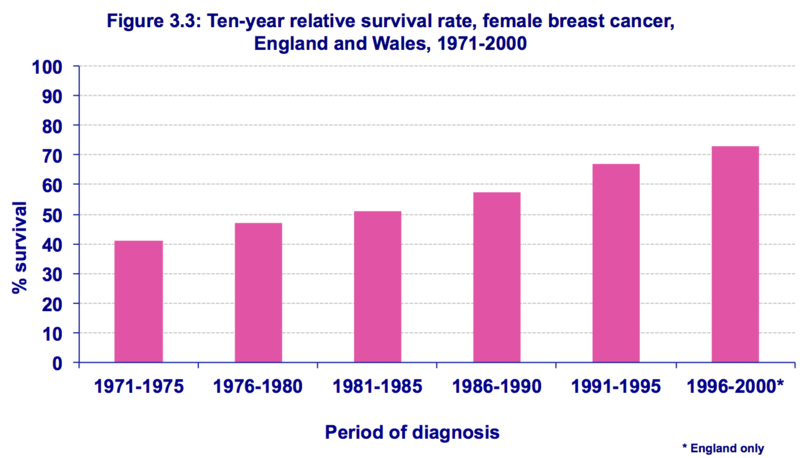 As you show from the pretty pink graph you’ve posted, breast cancer survival rates are improving massively. But this is not the case for other types of cancer. For some cancers, your chances of survival are very good; for others it is terrible. Why? Second, understanding this variation in cancer – why we make progress against some and not against others – is key to understanding which fields of human endeavour respond best to formal research and development efforts. Does it matter that lung cancer tends to affect poor people and breast cancer tends to affects middle class women? Or does it matter that the BRCA1 and BRCA2 are two of the best researched genes in our DNA? The answers to these questions are not just interesting, they are useful because they tell us whether to spend more money on geneticists, or more money on changing people’s risk exposure (such as smoking, exercise interventions, polluted water), or more money on training nurses and social support staff to help look after dying patients and their families. Third, these questions have not been voiced loudly so far because cancer has been handsomely well funded and had lots of attention (at least compared to malaria anyway). So far we have been able to keep giving more cancer money to everybody, more diagnosis, more nurses, more doctors, more scientists. But soon, as cancer starts affecting more people, choices will have to be made. And your effort to include as many people as possible in making those choices will become even more important. If war is too serious a matter to be left to military men, then the war against cancer is too serious a matter to be left only to scientists. Further to this article, I’ve added a link below to an article in the Guardian regarding a new development in chemotherapy. I cnnaot express my thanks enough for your views in this article. I am inspired to find out more and am hoping you plan to continue writing material like this. I’m glad you enjoyed the article. Feel free to subscribe that way you’ll be notified of my articles as and when I post them. My most recent article is about the immune system during pregnancy. I hope you enjoy it. Thanks for getting in touch.